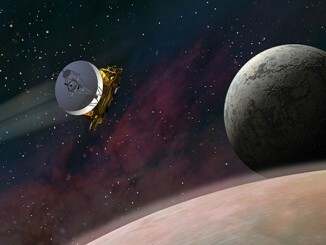 NASA’s New Horizons spacecraft doesn’t pass Pluto until July 14th — zipping by about 7,800 miles (12,500 kilometres) above the surface of the dwarf planet after a journey of almost 3 billion miles — but the mission team is making tantalising new discoveries as the piano-sized probe bears down on the Pluto system. 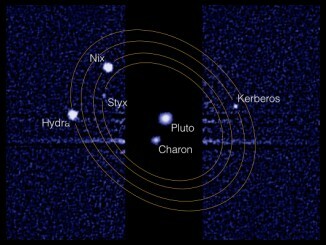 A comprehensive analysis of all available Hubble Space Telescope data shows that two of Pluto’s moons, Nix and Hydra, are wobbling unpredictably. 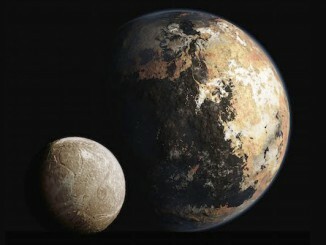 Scientists believe the other two small moons, Kerberos and Styx, are likely in a similar situation, pending further study. An international team using the Gemini Planet Imager (GPI) at the Gemini South telescope in Chile has discovered a young, emerging planetary system around star HD 115600 that has remarkable similarities to our own Solar System in its infancy. What a difference 20 million miles makes! 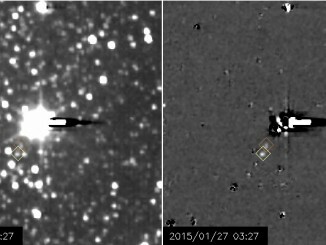 Images of Pluto from NASA’s New Horizons are growing in scale as the spacecraft approaches its mysterious target. 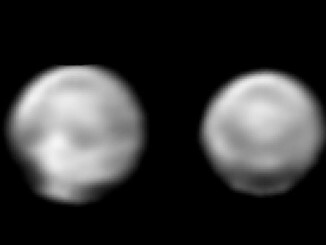 The new images, taken May 8th-12th using a powerful telescopic camera and downlinked last week, reveal more detail about Pluto’s complex and high contrast surface. For the first time, images from NASA’s New Horizons spacecraft are revealing bright and dark regions on the surface of faraway Pluto — the primary target of the New Horizons close flyby in mid-July. On July 14th, NASA’s New Horizons spacecraft will flyby Pluto, offering the first close-up look at that small, distant world. You can help decide what names will be used on subsequent maps of the dwarf planet and its largest moon, Charon, as the SETI Institute announces the launch of its “Our Pluto” campaign. NASA’s New Horizons spacecraft fine-tuned its path toward Pluto on Tuesday, firing its rocket thrusters for 93 seconds to aim for a fleeting flyby of the distant dwarf planet July 14. 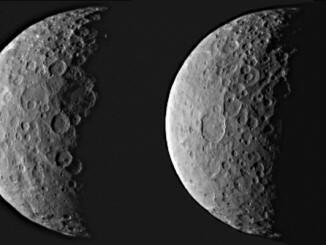 NASA’s Dawn spacecraft has returned new images captured on approach to entering orbit around Ceres on Friday, March 6th — the first mission to successfully visit a dwarf planet. Exactly 85 years after Clyde Tombaugh’s historic discovery of Pluto, NASA’s New Horizons spacecraft set to encounter the icy dwarf planet this summer is providing its first views of the small moons orbiting Pluto. 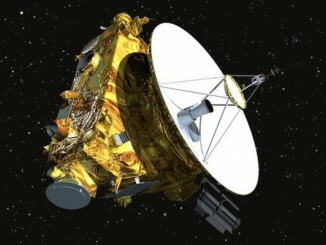 Speeding through the outer solar system after a nine-year trek from Earth, NASA’s New Horizons spacecraft is awake and preparing for an encounter next summer with Pluto. Get the latest astronomical news and stargazing tips delivered to your inbox.